Stickman Musings - A Blog: Angels And Demons And Half Ton Boys, Oh My! Angels And Demons And Half Ton Boys, Oh My! Yesterday afternoon, as soon as I decide to go and get my left over Greek Salad (it's the best from this pizza place around the corner! ), Mrs. Stickman decides to turn the TV to some show called Half Ton Teen. 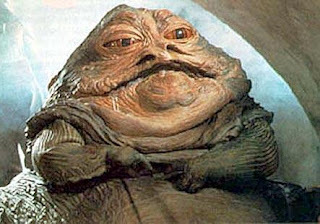 Looking at this grotesque pile of lard obese boy, I couldn't help but bereminded of Pizza the Hut from the movie Spaceballs, or Jabba the Hut from Star Wars. I promise you that this was the last thing that I needed to watch while I was eating. If I took all of the things that have ever been on television and ranked them in order of things I would like to watch while eating my leftover Greek Salad from the place around the corner (which is delicious), this show would be tied for last with Paula Abdul's comeback performance on American Idol, finishing one below a video of me diving into a wood chipper. I decided that she put this show on to torture me as payback for my having called her a demon just a few hours before this. I'm not sure what the problem was, it was preceded with "I love you." She asked me what I said, and I changed the demon to darlin'. And she said, "Oh, I thought you said demon." Hehehehe. But it was so good, that I had to come clean and tell her the truth. I had demons on the brain because I had just gone to see Angels & Demons. My review: It wasn't nearly as good as the book, but it was better than the Da Vinci Code movie. It had a lot faster pace that that movie, so it was much less boring to watch. Plus it had Tom Hanks in a Speedo, so who wouldn't want to see that right? In fact, that finished just above a video of myself diving into a wood chipper on my must see TV list. On my drive home from the movie, I was thinking that if that movie were to describe my house in would be Angel & Demons, since there is only one angel. And we all know who that is. Mrs. Stickman, of course. She must be an angel, she's always up in the air harping about something! Not really, I am the only angel. A fallen angel perhaps, but still an angel. In summary, DON'T WATCH HALF TON TEEN UNLESS YOU LIKE VOMITING! Leprechaun's For (Or Against) Obama! Fantasy Friday - Where Dreams Come True!